Disclaimer and Reliance of Posted Information. All written content, materials and images contained on this site have been provided for informational purposes only. No elements contained within this website claim to be, or constitute as, any legal or professional advice. Any and all materials herein should not be relied upon as such. We will not accept responsibility for any losses which may occur from accessing our information or reliance upon it. We work to the fullest extent permitted by English law and therefore we exclude all liability for losses or damages incurred either directly or indirectly, from the use of this website. Our terms and conditions of business follow the laws and rules and regulations set out by the United Kingdom. 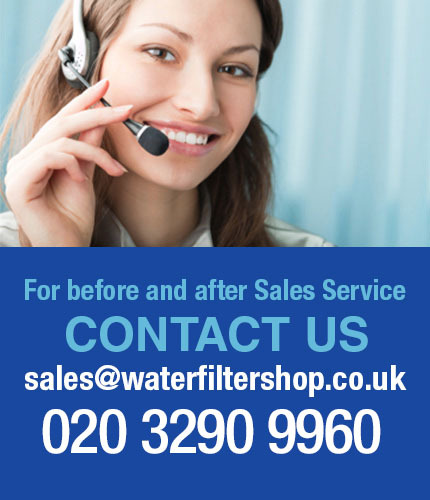 The terms on which we do business are directly in accordance to the Sale of Goods Act 1979.
https://www.waterfiltershop.co.uk/ is a website solely operated by Webshop Central Ltd. We are a company fully registered in England and Wales under registration number 8503847. Access to our website is only permitted on a temporary basis. We reserve the right to withdraw the services provided on our website without any prior notice. We will not be held accountable if our site is unavailable at any time or for any length of time. We are the full owners and licensees of all intellectual property rights within our website and in all of the material published on it. All works are protected by copyright laws and treaties around the world and all rights are reserved as such. You are permitted to print off one copy of informations held within our website, and may download an extract from any of our web pages for your own personal reference. You may draw the attention of others within your organisation only to specific content posted on our website. You are not permitted to modify any paper or digital copies of the content you have printed or downloaded in any way. You are also not permitted use any illustrations, photographs, video or audio sequences taken separately from any of our accompanying text. Our standing as the authors of the content on our site (and any of our contributors within it) must always be referenced and acknowledged as so. You are not permitted to use any part of the content on our site for commercial purposes without obtaining a full licence to do so. If you print off, copy or download any part of our content or website in direct breach of these terms and conditions of use, your rights to use our website will cease immediately. You must then return or destroy any copies of the materials you have made upon our request. We strive to update our website regularly and may change the materials and content at any time. If the need arises, we may suspend access to our website and have the right to close it indefinitely. Any of the material and content on our site may be out of date at any time, and we are under no obligation to update what is no longer current. Smaller items such as replacement cartridges and water filter bottles will usually be sent via Royal Mail within 1-2 days. Countertop and Undersink water filters will be sent with Interlink Direct/DPD courier by the next day, by 1pm at the latest. During the holiday season we regret that some brief delays may happen. We strive to uphold all delivery times as best we can. You are responsible for the return of any goods supplied by us, and therefore we cannot accept any responsibility until said goods are received by us. Any costs incurred by returning the goods to us are payable by you and all returned goods must be sent back via recorded delivery as we cannot track goods sent via standard mail. If there are any missing or damaged parts, we reserve the right to refuse the refund or to deduct funds from any refund payable to you, for the value of the missing or damaged item. Refunds will only be credited to the original credit/debit card used to make the initial purchase and will only be made after the goods have been received and inspected by us. You hold responsibility for the returned product(s) until such time as we receive them. All returns must be properly addressed and packaged to prevent any subsequent damage. All conditions of, warranties and other terms and conditions which might otherwise be implied by statute, common law or the law of equity. Loss of sales traffic and business. Wasted office time or management time. For any other loss or damage of any kind, whether caused by negligence or breach of contract. This condition shall not prevent claims for loss of, or damage to, your tangible property or for any other claims for direct financial loss that are not excluded by the categories listed above. This does not directly affect any liability for death or personal injury caused as a result of our negligence. Our liability for fraudulent misrepresentation or any other liability which cannot be excluded or limited under applicable law will not directly affect liability either. Personal information regarding you and your visits to our website. You must not misuse our website by willingly introducing viruses, worms, logic bombs or any other materials which are malicious or technologically harmful to us. You are not permitted to attempt to gain unauthorised access to our website or the server on which our website is stored. You must not attack our website via a denial-of-service attack or by a distributed denial-of service attack. By breaching these provisions, you would be commiting a criminal offence under the Computer Misuse Act 1990. We can and will report any such breach to the relevant law enforcement authorities and will endeavour to co-operate with those authorities fully by disclosing your identity and given details to them. In the event of such a technological breach, your right to use our site will be stopped immediately and indefinitely. We will not be held liable for any losses or damages caused by a distributed denial-of-service attack, viruses or other technologically harmful material that may infect your computer equipment, computer programs, data or other proprietary material due to your use of our site. We are also not liable for any downloaded materials from ourselves or any website linked to us. The English courts will have non-exclusive jurisdiction over any claim caused by, or related to, a visit to our website. These terms and conditions of use and any dispute or claim caused by, or in connection with them or their subject matter, shall be governed by and construed in accordance with the laws and regulations of England and Wales. We may revise and change these terms and conditions of use at any time by amending this page. You are expected to check this page from time to time and to take notice of any changes we may make as they are binding to the consumer. Please be aware that some of the provisions contained in these terms and conditions of use may also be superseded by provisions or notices published elsewhere on our website. Thank you reading these terms and conditions of use and for visiting our website.